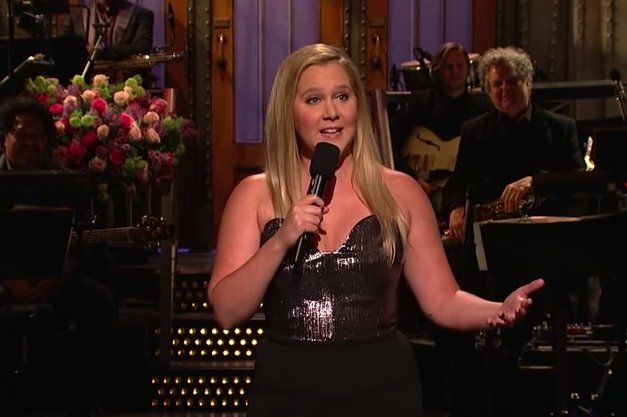 Amy Schumer explains the torture of being a bridesmaid in your late 30s on "SNL." Amy Schumer hosted a new “Saturday Night Live” last night in an episode that paid special homage to Mother's Day. The cold open, which has garnered some exhaustion from audiences throughout the season for its consistently politically-charged scenes, gave Alec Baldwin a break by instead bringing some of the cast’s mothers on stage for what turned into a not-so-subtle roast of the show. Check out some other highlights from Schumer's second time hosting. Schumer’s opening monologue was a true callout to her stand-up, where aging bridesmaids, tampon girth, and the lies of girlhood were each dissected. Schumer plays a mom telling her son about the wonderful day he was born, all the while the pre-filmed sketch jumps back and forth to the reality of childrearing. Keeping up with the theme of Mother’s Day, Michael Che got a visit from the “World’s Proudest Stepmom” -- Melissa McCarthy. “SNL” returns Saturday, May 19 with the season finale hosted by show alum and Upper Darby native Tina Fey, joined by musical guest Nicki Minaj.